Endless summer fun awaits! There are so many fun summer activities in San Jose; but, nothing can compare to Raging Waters San Jose, Northern California's premier water park. 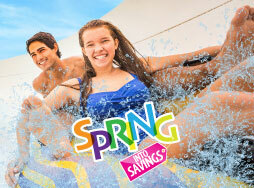 A Season Pass to Raging Waters gives you unlimited visits all summer long, making this summer the best one yet! Enjoy scenic panoramic views of Lake Cunningham and the San Jose Foothills, over a million gallons of water attractions, and 23-acres of family fun! Select the Pass that Works Best for You! One Bring-A-Friend Ticket valid Opening Day - 6/21/19. Not valid on first visit. Will receive ticket when processing pass on first visit at Season Pass Processing. Passholder must be present to use ticket. One Bring-A-Friend Ticket valid weekdays 6/24-8/9/19. Not valid weekends or holidays. Not valid on first visit. Will receive ticket when processing pass on first visit. Passholder must be present to use ticket. One Bring-A-Friend Ticket valid weekdays 6/24 -8/9/19. Not valid weekends or holidays. Not valid on first visit. Will receive ticket when processing pass on first visit. Passholder must be present to use ticket. $2 off Regular All Day Locker Rentals! Must have processed Season Pass before discount is available. VIP Bring-A-Friend ticket valid any weekday operating day during the 2019 season. Not valid weekends or holidays. Will receive ticket when processing pass on first visit. Passholder must be present to use ticket. Unlimited Free Soda during the 2019 season. Check Important Season Passs Details below for more information. Unforgettable fun awaits at Raging Waters San Jose! Be ready to enjoy a summer of endless fun with a Season Pass. 2019 Season Passholders can purchase the All Season Dining Pass for only $59.99! 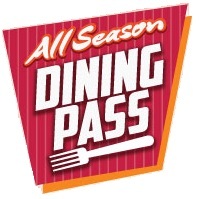 The All Season Dining Pass permits a 2019 Season Pass holder to redeem their dining pass at participating locations throughout the park for 1 Combo Meals EVERY visit during the 2019 Summer Season. DINING PASS DOES NOT INCLUDE ADMISSION TO PARK. DINING PASS EXPIRES SEPTEMBER 8, 2019.